I have been quoting from a blog post I found on Lifehacker. I don’t particularly like the heat and humidity that comes with the summer months in the Midwest, but I wondered if others have heard of a disorder of what I am about to share with you from Leigh Anderson. She wrote her blog post on June 20, 2017 and titled it, How to Survive the Summer When Summer Makes You Miserable. “For me, summer is a challenge to my mood, but a manageable one: I can deal with and even enjoy July and August with a few lifestyle modifications. For others, the summer triggers a full-blown depression known as reverse seasonal affective disorder. Just as some people experience mood lows in the cold months, others feel crummy in the summer. And like the winter blues, the disorder exists on a spectrum: Some people get a little down; others feel so low that they entertain suicidal thoughts. To get a better understanding of reverse seasonal affective disorder and how to combat it, I spoke to Dr. Norman Rosenthal, a professor of psychiatry at Georgetown and the author of Winter Blues. “This seems obvious,” Dr. Rosenthal said, “but stay cool. There are lots of thing you can do—cool baths and showers. Keep blinds and shades drawn to prevent a greenhouse effect in your home.” If getting overheated makes you feel irritable and stressed (as it does for me) or depressed, make staying in the air-conditioning a priority. Some summer depression people sleep with ice packs or cooling pads (or a Chillow); I keep my bedroom at an arctic temperature starting in early June. Depressed people tend to higher body temperatures at night than non-depressed people do, and Dr. Rosenthal found that patients wrapped in cooling blankets experienced relief from their symptoms (that was short-lived when they went back out into the heat). The piece of advice about keeping shades drawn has a second element to it: “Some of the reverse SAD might be induced by the light,” says Dr. Rosenthal. “It’s not entirely clear, but I have seen cases in which I am convinced the light is a significant factor.” Some doctors think that the bright, long days modulate melatonin production and affect mood, just as low light levels affect mood for some people; others think that the long days wreak havoc with circadian rhythms and so disrupt sleep cycles. 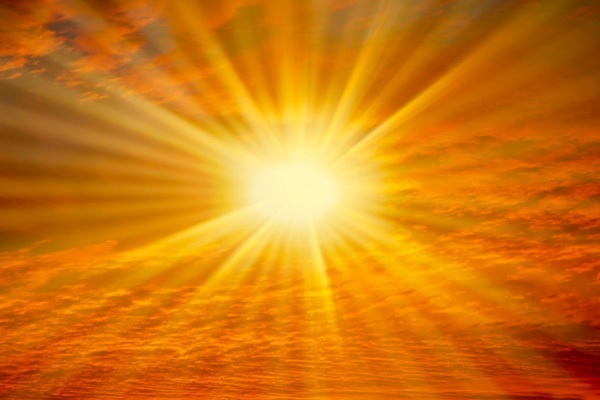 And here’s an interesting commonality among reverse SAD sufferers: Some people report that the bright sun feels like an “assault” or an “attack”—which is exactly how stepping out the front door into the burning sun feels to me. I manage this reasonably well with a big hat and big sunglasses, and in my bedroom I have blackout shades so I can start winding down for sleep when the sky is still light (and not have the 5AM dawn roust me too early). Dr. Rosenthal notes that he has had patients judiciously expose themselves to bright sunlight with good results: He had a colleague who suffered from reverse SAD who would step out into the light in the morning for very short periods—10 or 15 seconds—and she found that brief exposure, combined with the other defensives measures, to be therapeutic. If you generally like to be outdoors, make sure you do it in the early morning or late evening when it’s cooler and the sun isn’t so bright. I still take an early-morning jog and have a cocktail on the porch in evening, but I do my best to be inside during the brightest part of the day. At the very least, be strategic about your leave, says Dr. Rosenthal, and “take a trip away from the equator.” He had a patient who took a summer holiday to upstate New York and experienced immediate relief after a vacation swimming in the cool water of the Finger Lakes. One of the particularly insidious things about warm-weather SAD is that summer is supposed to be a bacchanal of good times: waterskiing, beach frolicking, back-porch grilling. It can take a while to come to terms with your own aversion to hot, bright weather, because it seems so incredible—who doesn’t like summer? I was well into adulthood when I realized that sitting on a scorching beach actually induced a mild feeling of panic rather than excitement. A friend recently invited me to her beach club and my first question was “is there ample shade?” But I’ve finally come to terms with it: This is my neurology, and there are actually upsides—in October I get a huge mood boost, bordering on giddy, that lasts through March, even when I’m dressed in Fargo-like outerwear and leaning headfirst into a biting wind. The sound of football games and the smell of hearty stews on the stove make me feel literally like dancing. Exercise is a known mood booster, but a sweaty jog in the humid mid-day sun is not at all fun for reverse-SAD people. I asked Dr. Rosenthal about swimming, and he agreed that swimming is great if that’s your thing, but the effort that surrounds swimming—getting to the pool, changing, showering, showering again, changing again—can make it impractical for a lot of people. He recommends investing in a piece of equipment you can use at home, like a exercise bike, to get your cardio in without exposing yourself to excessive heat and light. I take my morning run at dawn, when I can still manage without sunglasses, and that keeps my mood reasonably stable all day. Warm-weather depression tends to take the form of insomnia and agitation, rather than the low funk of the winter blues, and that agitation can lead to suicidal thoughts. If this is you, please see a doctor. Dr. Rosenthal has patients who take medication cyclically for seasonal depression—ramping up in February and March for the summer people and in the fall for the winter people. If a big hat and a trip to Portland isn’t helping, it might be time to consider intervention from a medical professional.